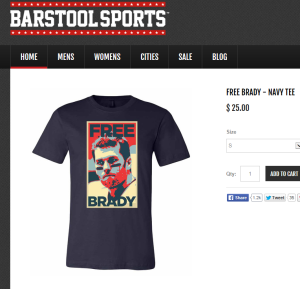 Free Brady!—Did Governor Baker’s T-Shirt Have a Copyright Problem? Tom Brady will be in New York today at a hearing in the litigation over his 4-game suspension by Roger Goodell for allegedly being “generally aware” of the deflation of footballs in the AFC Championship thrashing of the Indianapolis Colts last winter. For good legal analysis of the absolute fiasco that is the NFL’s attempt at a middle-school science project (instigated by the condition of a football introduced from the opposing team—but congratulations on another AFC Finalist banner) and the resulting adjudicatory process, I suggest John Dowd’s blog (“The NFL's investigation of and rules against Tom Brady are a travesty, and they've resulted in uncalled-for penalties. And it's all based on a report that lacks basic integrity, fairness and credibility.”). Dowd is an experienced federal prosecutor and led the investigation, among others, into Pete Rose and gambling for Major League Baseball. Most notably, he was sufficiently offended by the whole exercise to take the issue up with no relationship to the parties. Mike Florio at ProFootballTalk and Steph Stradley have also covered the story well.